Sealing and/or filling cracks in existing pavement is the single the most effective procedure that can be performed to extend its lifecycle. By filling and sealing cracks water is prevented from penetrating beneath the asphalt surface where it causes the majority of distresses and failures by weakening the base and sub-base. Unsealed cracks also allow sand, dirt and other non-compressible substances to enter the cracks which interferes with the expansion and contraction of the pavement. This simple procedure is the most cost effective pavement maintenance technique and one that can greatly extend the life of asphalt pavement. When presented with cracked pavement the contractor and client must decide the best course of action to take in treating the problem. Both crack sealing and crack filling offer their own set of benefits to the pavement’s owner and should be weighed carefully. While crack filling is less costly and will require less initial investment, the long term may require more frequent treatment to keep the cracks at bay. Therefore crack filling is usually performed on non-working cracks, cracks that are not expanding or contracting, and is considered to be a temporary fix. Once the cracks begin to move the crack filling material loses its effectiveness and the cracks have to be re-filled. The regions temperature cycle can also play a large role in how much cracks expand and contract throughout a given year. Therefore crack filling is most effective in milder climates with less extreme temperature swings. 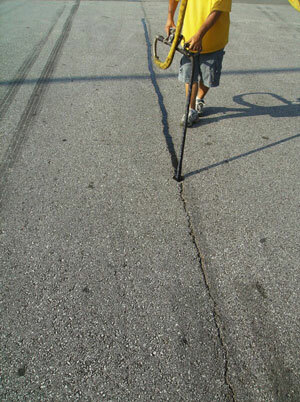 Crack filling materials include liquid asphalt, asphalt emulsions and cutbacks. Crack sealing is a more costly procedure for the pavement owner but provides substantial value due to its long life expectancy. While crack filling may only last one or two seasons depending on the cracks activity, crack sealing can last up to 8 years or more and is considered a permanent treatment. Crack sealing is the only effective treatment for active cracks that contract and expand from season to season. In areas where temperatures rise and fall dramatically crack sealing is usually the only option unless crack filling is requested by a property owner as a very temporary fix. The permanent nature of crack sealing is credited to the flexibility of the specially prepared hot pour rubberized sealant. Crack sealing materials include asphalt rubber, rubberized asphalt, low-modulus rubberized asphalt and self-leveling silicone. When helping your client decide between crack sealing and crack filling it is best to describe the different natures of the materials used in each process and when they are most effective. Even though crack filling is considered a temporary fix, your clients asphalt may be non-working or low in activity. This can be the case especially in climates that stay relatively consistent throughout the seasons. In this case it may be OK to simply fill the cracks and keep an eye on them. It may also be the case that the clients budget doesn’t allow for a more expensive treatment and understands that more permanent measures will need to be taken down the road. If the clients budget will allow for a more permanent treatment, crack sealing is almost always the best option. As stated, crack sealing materials allow for the seasonal contraction and expansion of cracks common in most areas of the country and is sure to last many years. When the client is well informed of the different benefits and draw backs of each process you will both be able to make the decision that best fits their current need or situation.